Research suggests that transcranial Photobiomodulation (PBM) could be helpful with long-term symptoms from repeated head injuries in professional contact sports. Two cases reported by Dr. Margaret Naeser of Boston University (BU) Medical School and VA Boston Healthcare System support this. The subjects were retired professional football players suspected of having chronic traumatic encephalopathy (CTE). CTE is a subject of much discussion in the world of contact sports. Furthermore, in advanced cases, CTE can result in cognitive impairment, deep depression, uncontrolled behavior and even suicide. Thus, the subjects in two cases where treated on-site at BU with PBM. The subjects presented improvements in the measured symptoms of post-traumatic stress disorder (PTSD), depression, sleep, executive function and memory. Subsequently, in both cases the subjects regressed when treatment stopped. However, in Case 1, the subject recovered at greater magnitude, after resuming PBM treatment at home using Vielight Neuro Gamma. Dr. Naeser will present her findings in a poster at the 13th World Congress on Brain Injury in Toronto held on March 13-16, 2019. A plan is now in place to commence a randomized controlled study involving 20 subjects. The subjects will have to present at least six months of symptoms of mild to moderate traumatic brain injury (TBI). The study, to be led by Dr. Naeser, will involve using the Neuro Alpha as a treatment modality. Potential candidates with symptoms of TBI living in the Boston area can contact Vielight regarding participation in the study. Larry Carr was Case 1 in Dr. Naeser’s report, and he expressed his wish to share his story. Before earning his Ph.D., Larry was a hard-hitting Brigham Young Hall of Fame football player. 45 years later, he still holds the university’s record for the most tackles. Today researchers know that each tackle is like a car accident, and some hits approach 100 G’s. Larry did not know it then. In his career, Larry took an estimated 3,000 hits to the head, which caused injuries and brain damage. In 2011, he was diagnosed with possible CTE, a condition which can only be confirmed at a post-mortem examination. With suspected CTE, he suffered daily from unstoppable spontaneous bouts of anger, anxiety, uncontrollable rage and stress that lasted for hours, sometimes, days. These waves were followed by feelings of shame and regret. Moreover, he had huge deficits in memory, executive function, and processing. Some individuals with CTE feel utter helplessness and hopelessness, some turn to drugs and suicide as a solution. For Larry, things started to change, when he was a participant in Dr. Naeser’s study. In this study, he received eight months of treatments. These included withholding of treatment, pre- and post-testing with fMRI imaging and complete neuro-psych testing. Larry’s test results showed significant improvements in the complete range of neuro-cognitive tests that exceeded the expectation of the researchers. His results have been presented in three medical conferences. Larry expressed: “The treatment using the Vielight Gamma and 633 Red saved both my life and my marriage”. Toronto will host the world’s largest international gathering of professionals working in the field of brain injury. This is the 13th International Brain Injury Association (IBIA) World Congress 2019. This year it takes place at the Sheraton Hotel in Downtown Toronto on March 13-16. Among participants are over 1200 physicians, psychologists, neuropsychologists, therapists, social workers, case managers, nurses, legal professionals and advocates. They will have the opportunity to advance their knowledge in brain injury science, medicine and care. The knowledge base will cover issues from basic to clinical coma and to traumatic brain injury. Vielight has a booth at this conference to showcase the potential of its technology for brain injury and to discuss its use in related clinical studies. 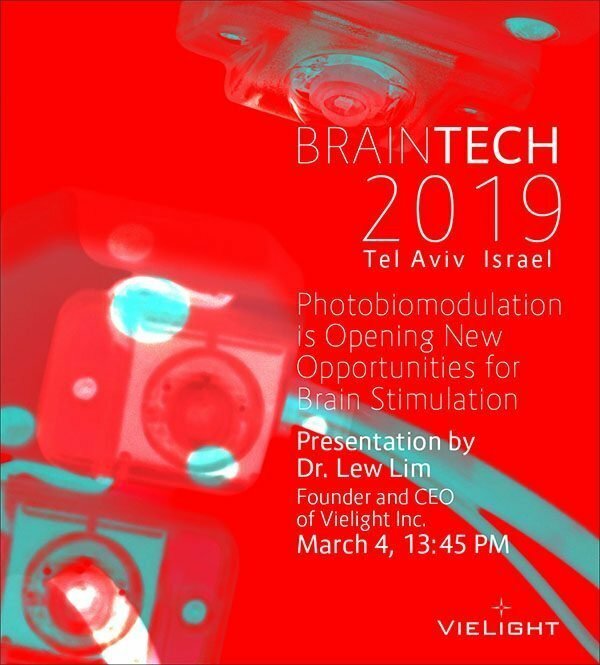 For the first time Vielight will be participating at the 4th International Brain Technology Conference, — BrainTech 2019, in Tel Aviv, Israel from March 4 to 5. This conference is the brain child of former President Shimon Peres. It’s mandate is to establish Israel as a leading international brain technology hub by creating the non-profit Israel Brain Technologies. share the Vielight innovation at an international stage representing brain technology”. Vielight welcomes Diana into the team to support our busy and growing operations. Diana has an exceptional background and holds a double major in Forensic Science and Biology. Moreover, she is a trained registered nurse and holds diplomas in Canadian Medical Laboratory Assistance and Certificate in Ontario Society of Medical Technologist (OSMT). In addition, she has experience as a research analyst, as well as in data entry, shipping and customer service.